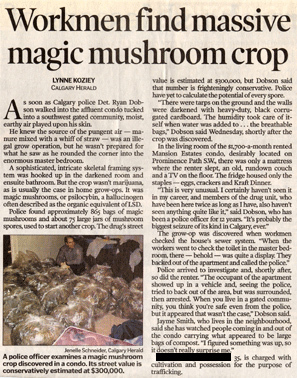 Workmen find massive magic mushroom crop - Patrick C. Fagan, Q.C. As soon as Calgary police Det. Ryan Dobson walked into the affluent condo tucked into a southwest gated community, moist, earthy air played upon his skin. He knew the source of the pungent air — manure mixed with a whiff of straw — was an illegal grow operation, but he wasn’t prepared for what he saw as he rounded the corner into the enormous master bedroom. A sophisticated, intricate skeletal framing system was hooked up in the darkened room and ensuite bathroom. But the crop wasn’t marijuana, as is usually the case in home grow-ops. It was magic mushrooms, or psilocybin, a hallucinogen often described as the organic equivalent of LSD. Police found approximately 865 bags of magic mushrooms and about 75 large jars of mushroom spores, used to start another crop. The drug’s street value is estimated at $300,000, but Dobson said that number is frighteningly conservative. Police have yet to calculate the potential of every spore. “There were tarps on the ground and the walls were darkened with heavy-duty, black corrugated cardboard. The humidity took care of itself when water was added to . . . the breathable bags,” Dobson said Wednesday, shortly after the crop was discovered. In the living room of the $1,700-a-month rented Mansion Estates condo, desirably located on Prominence Path S.W., there was only a mattress where the renter slept, an old, rundown couch and a TV on the floor. The fridge housed only the staples — eggs, crackers and Kraft Dinner. Police arrived to investigate and, shortly after, so did the renter. “The occupant of the apartment showed up in a vehicle and, seeing the police, tried to back out of the area, but was surrounded, then arrested. When you live in a gated community, you think you’re safe even from the police, but it appeared that wasn’t the case,” Dobson said. The accused, 35, is charged with cultivation and possession for the purpose of trafficking.